While I have used many standard cycling water bottles in 16 & 24 oz sizes, I prefer to use larger, one liter (32 oz) bottles while off the bike. While on the bike, I have used many water bottle cages over the years to carry standard cycling water bottles on my bikes and I definitely prefer those cages that are constructed of stainless steel. Stainless steel is very durable, does not rust, and will not mark up bottles like aluminum water bottle cages can. Widefoot Design has introduced a way that may allow me to use the larger one liter bottles with a large, stainless steel cage they call the LiterCage. In this article we will take you with us on our first look of this cage and why you would even want to bring a larger, one liter bottle on your ride instead of the customary smaller cycling squeeze bottles. Off the bike, I have had considerable experience with the 1 liter, screw top, wide mouth, 3.5 inch diameter bottles made popular by Nalgene, Hydroflask, and Klean Kanteen. These bottles have served me well over the years on backpacking trips, long drives in the car, days spent at the beach, camping opportunities, as well as everyday in the classroom and in the office. I almost always prefer to have one with me no matter what the situation. It has proven to be a great approach for staying hydrated while preventing unnecessary plastic waste that would otherwise occur when resorting to the typical 16oz disposable water bottles which have become so prevalent in our society. Besides the aforementioned benefits, I have grown fond of other benefits of the Nalgene and Hydroflask bottles, which were described in the comparison video shown below. Cycling style water bottles that you squeeze are great for carrying water that needs to be accessed and consumed quickly while riding, but while out on longer rides in remote areas, common when bikepacking or on all day exploration rides, those bottles just can’t hold enough capacity. I recently departed upon a 40+ mile bikepacking trip, with significant climbing and 90F weather. While I had four of the 24oz cycling water bottles filled for the trip and thought I would be able to refill along the route, the well and water source we had counted on had run dry. 7 hours after we started, we were able to refill. Water bladders in frame bags are often great options for these types of trips, but they are often very difficult to refill and nearly impossible to clean out while out on an overnight. If you are like me and prefer to have electrolyte-based drink mixes in your water, water bladders are not what you will primarily drink from. I will often use multiple bottles for drink mixes, mounted to the three hole Anything Cage mounts on Salsa Cycles fork legs and/or in stem bags, while keeping a water bladder in the frame bag to use as my refill station/water reservoir. I have gotten into the habit of looking for locations along the route to take the necessary time while I stop and refill my cycling water bottles, dig out the drink mix, and put everything back where it was. While refilling the cycling water bottles is not too cumbersome, I have become spoiled with my Hydroflask bottles that have double walled insulation. This keeps the drink cold for many hours in the heat. I also have become spoiled with the Nalgene bottles as they have volume graduations on the side to indicate the quantity of water consumed and the quantity remaining. This feature is especially helpful when an exact quantity is required, such as for cooking, reconstituting a dry mix, or fixing a drink mix. Because of the myriad of benefits associated with containers like these, I have often desired to have a larger water bottle cage to fit them. Enter the Widefoot LiterCage. The Widefoot LiterCage bottle cages are designed to fit these 3.5″ diameter bottles like a standard water bottle cage would fit on a standard cycling water bottle. The LiterCage is made in the USA, of stainless steel, and has 5 holes for many different mounting options. The top hole, middle hole, and bottom hole are designed to mate with the 3-bolt bosses, often used for mounting Anything Cages. Any two successive sets of the 5 available holes will allow mounting to standard cycling water bottle cage mounts found on most bicycle frames. This means you have the flexibility to move the LiterCage up or down to get your water bottles positioned more precisely where they work best for your particular application. The LiterCage also employs bracket slots for mounting it just about anywhere on the bike by utilizing hoseclamps threaded though these slots. 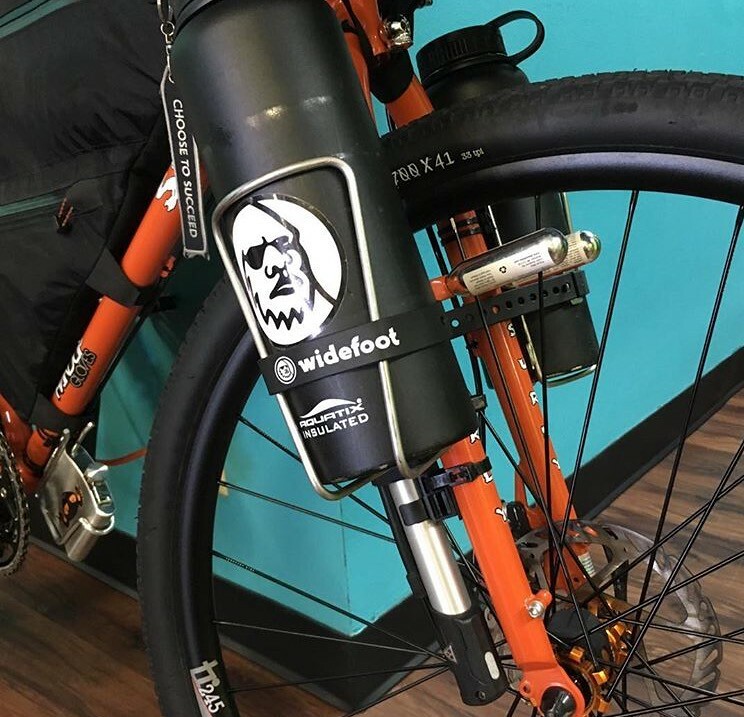 Whether on the bottom of the bike frame down tube, fork legs, or even the top tube, the LiterCage provides the ability to add extra water (or liquid fuel) carrying capacity to any rig. Widefoot Design does not recommend using hose clamp mounting for carbon or thin-walled aluminum frames. When I first mounted the LiterCage to my 17 inch Salsa El Mariachi frame, I was hopeful that I would be able to fit 2 LiterCages inside the main triangle of the frame by utilizing both water bottle mounts. Unfortunately, the vertical mount that is located on the seat tube is so low that the bottles hit the down tube when inserted. This mount is so low that normal water bottles have actually made a small abrasion thought the paint on the top side of the down tube already. I suspect this will not be a problem with many other frames on the market. Instead of using this position, I mounted one LiterCage to the down tube water bottle cage mount. I decided to first test it in a middle position, using third and fourth holes down on the LiterCage. I first tried it with a Hydroflask on a hot day. 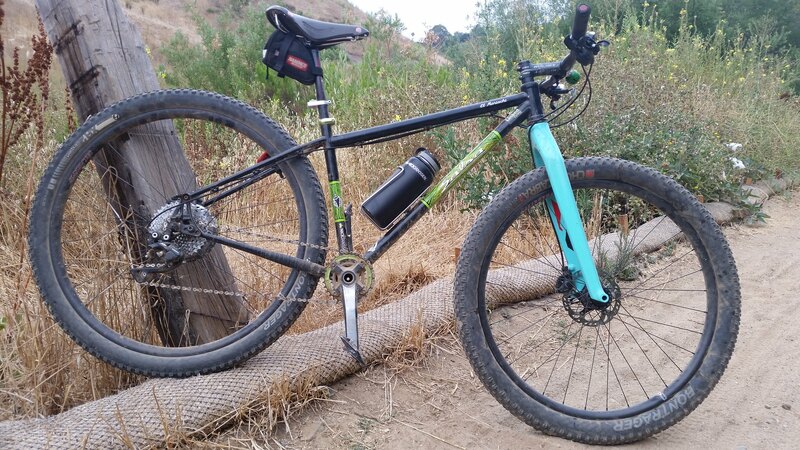 The trail I rode was not the roughest trail in the area, but did have significant technical sections that caused metallic rattling of the heavy, full, Hydroflask in the LiterCage. It was quite distracting at first with the full Hydroflask rattling around over the rougher sections while the LiterCage was mounted in this middle position. I rode with it like that for 1-2 miles, then thought I would try rearranging the cage to see if I could get it to quiet down. I kept the seat tube free of water bottle cages and tried the LiterCage positioned as low as possible on the down tube. I mounted it using the the highest mounting holes, first and second from the top which got the Hydroflask a little lower as seen in the image below. This got the weight a little lower on the frame and there was a definite decrease in noise. The rattle would continue, but not as frequently and with less intensity. 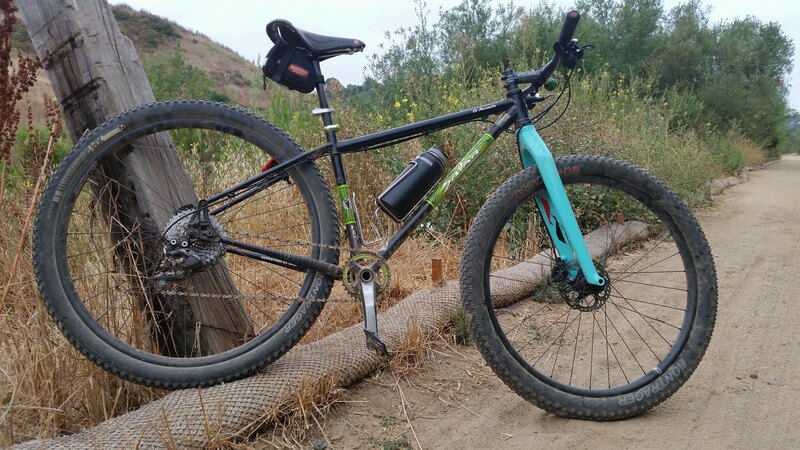 I rolled some rock gardens at full speed aboard the El Mariachi with rigid carbon fork and while the rattling, metal-on-metal noise returned, I could not get the heavy bottle to eject. I received an email from Marc at Widefoot Design about their new Widefoot Straps they had been testing. He said they have found they “add some extra grip when carrying oversized metal bottles” and asked if I would want to test them out. We received the Widefoot Straps a short time ago and I imagine they will work well to eliminate the metal on metal rattle that I experienced. They are 20 inches long and 3/4 of an inch wide, and made in the USA. Here is the unboxing video we made when the straps arrived if you would like to see them in more detail. On another ride, I tried a plastic Nalgene bottle instead of the metal Hydroflask and found there wasn’t much, if any noise coming from the bottle/LiterCage interface. Nalgene bottles and Hydroflask bottles both have their own unique pros and cons. With the Hydroflask and Nalgene bottle screw tops, the screw top keeper (a piece of plastic that keeps the top connected to the bottle) creates a loop when closed and I found that this loop needs to be positioned in-line with the bike frame in order to avoid contact with my knees as they passed by. Accessing the contents via the screw top is definitely more time consumptive compared to grabbing a cycling water bottle and taking a drink immediately, but it was not as prohibitive as you might initially have thought. There are other tops available that allow an easier one-handed drinking solution from these types of bottles, but I wasn’t able to try any for the first few rides prior to publishing this First Look article. I will be testing this cage with the one handed solution very soon and continue to test it with as many bottles as I can, in as many situations as possible. A full review of both the LiterCage and the Widefoot Straps will be up after a few more months of testing. The LiterCage is made in Nebraska, USA and retails for $25 each with free shipping. The Widefoot Straps are also made in the USA and available now for $7 each.